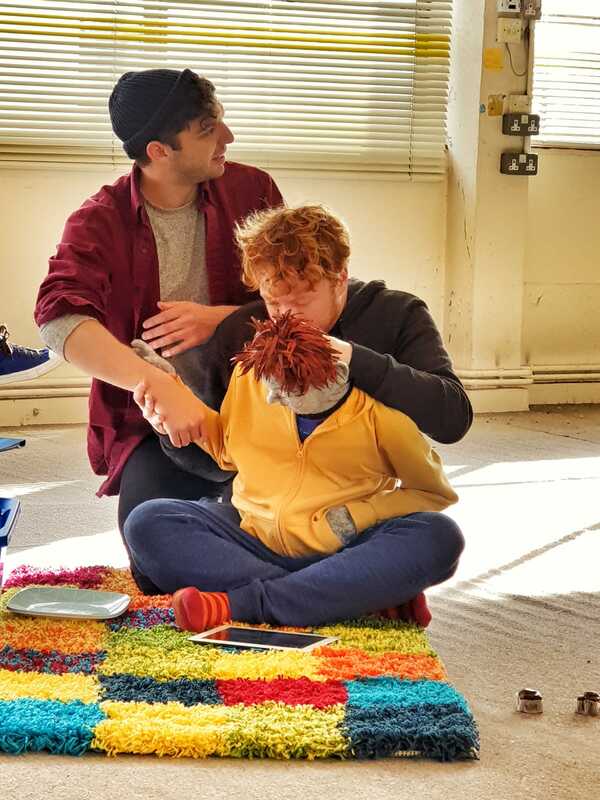 ‘All in a Row’ is a new play from Alex Oates which is at the Southwark Playhouse; as of today (10th February 2019) it is yet to open to the public. 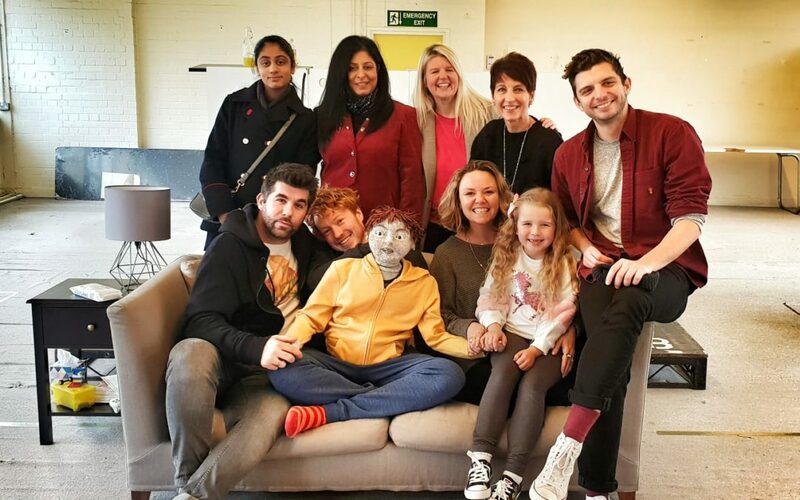 It would be fair to say the play has attracted some unfavourable comments, mainly because of the use of a grey faced puppet to portray an 11 year old boy, Laurence, who has a diagnosis of autistic spectrum condition with some challenging behaviour. The description of Laurence as being “autistic, non-verbal, and occasionally violent” is a little unfortunate. That said, I doubt if even the plays harshest critics would claim that Mr Oates is attempting to be deliberately offensive. The story is set the day before Laurence is about to go to a residential school and, presumably, he is given a grey face because he is utterly dis-empowered from taking part in this process due to his difficulty with communication. The criticism of the play has been fierce, a lot of focusing on the more obvious aspects of the play particularly the use of the puppet and from the photos shared, dehumanizing the character. Whilst I originally thought it may have been better if a real child could have played this part, after watching the rehearsal, the theatre said this was laden with issues due to the highly charged emotional scenes in the play. I must say because of the social media negativity towards the puppet it was the first aspect of the play I was searching for. It is actually just the upper torso made of soft grey felt fabric which is pliable and moves with ease and it is attached to a very talented puppeteer Hugh Purves. His lower body became the lower part of the boy. The colour grey and type of felt fabric used I was told it would lend itself to the lighting on stage which I didn’t experience due to the rehearsal not based in the theatre. 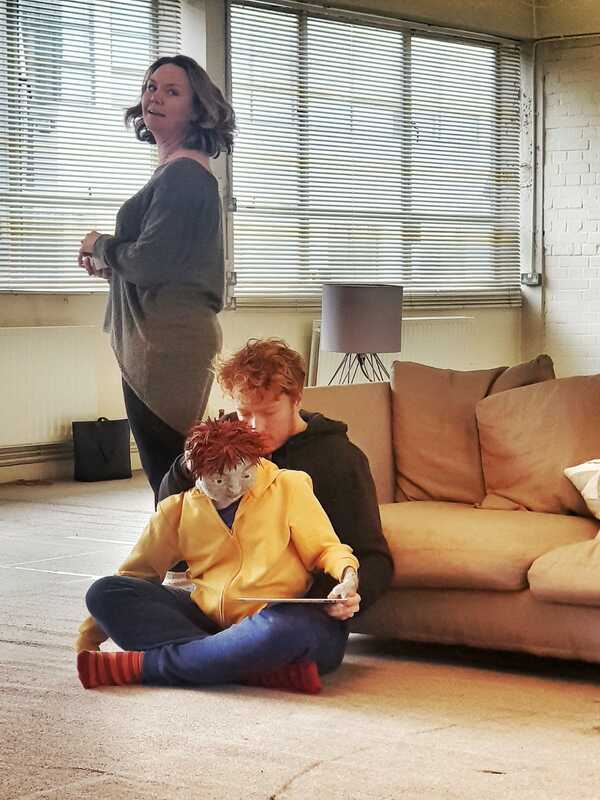 In summary, ‘All in a Row’ is a play about the turmoil that a husband and wife are feeling the day before their beloved son is due to leave home. He is going to live in a residential placement 200 miles from their home. Their only solace at this traumatic time is that there will be horses, which is repeated many times throughout the play by Tamora and Martin for reassurance. I wanted to make my own mind up about the play since I am a firm believer ‘if you haven’t seen it with your own eyes or heard it with your own ears its best to park it there’. It has great potential to raise autism awareness and to show the impact of making such a HUGE decision and my opinion to be given a fair hearing. My suggestion would be that before commenting on the play, people should see the play first and evaluate what the writers and actors were trying to achieve and comment accordingly. If you still don’t like it, fair enough, and they can share your observations with the theatre in the Questions and Answer session on some of the days at the end of the play. Having viewed all the harsh negative commentary on social media I had originally thought people had seen the play or they knew something that I didn’t. With real nervousness and trying to keep an open mind I was more than happy to be invited to the rehearsal. I can honestly say I was taken back with the raw and honest performances from all the actors. You can see how people on the spectrum had in one way or another touched the performers lives themselves. I found it at times so difficult to watch as it was a replay of my life in front of me, on a stage. But, I loved every moment. I was in no way offended by the puppet. In many ways, it was the perfect way to depict their son. The story is about a strained relationship held together by their son. The cracks in their relationship resonated with me, I have supported many families where each partner wants a different outcome, but the underlying message in all of this is how deeply they love their son and accepting there is no shame in asking for help. Seeing the heart wrenching dynamics between the parents and the carer made this an emotional and gripping drama. First class acting and fantastic portrayals by the actors – I felt every feeling and emotion that they went through. I didn’t want it to end. I too was intrigued to see what my thoughts were on the puppet Laurence but I can honestly say that once the play had started, the focus wasn’t on him. This story is about the feelings and emotions that go with having to make life changing decisions like this. It was refreshing to see a play from the prospective of a mum, dad and carer who, may I add, did a superb job in portraying the roles. Surprisingly to me, I found him really endearing towards Laurence in the few scenes that were centred around him. I did not see him as a puppet, he was in fact Laurence. Being such a small cast of 4 including Laurence himself was perfect and it did not seem out of place to not use a child. I would in fact feel more uncomfortable had they have used a child due to some of the language and emotional scenes, hence why it has a 16+ age minimum. My final thoughts as an Autism Advocate and Chair of an Autism Awareness Charity is that what is not helpful is criticism without evaluation. My concern is with this that autism may become a “toxic” subject in people’s minds and future films documentary or plays and reporters and artists etc may be afraid to go near it – and I am sure none of us want that as an autism community. You obviously see where people are coming from with their doubts about using a puppet instead of a human. But it may not be a good thing for all to see for many reasons & I’m not talking about age, I work with almost no verbal autistic people with learning disability & many comorbid conditions. I also wonder how useful it will be seeing this kid as a puppet boy ? autistic friend who have already had problems with people & professionals saying they’re robotic ,have no empathy like robots surely this could make this kinda thing worse ? For some. I saw this play today. I only wished I had seen it earlier in its run when I could have spread the word about how good it is. As a family we were intensely moved by the issues raised and the playing of the characters including Laurence the 11 year old at the centre. All the mistakes that families make, the shame, the sadness and the overwhelming impact of having someone who has severe autism, challenging behaviour and very limited communication, is on show. But also warmth, humanity and ultimately some resolution. If ever something demonstrated that people should see and experience before commenting this play was it.